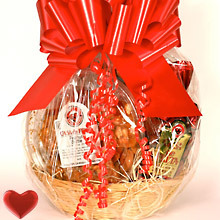 Cupid's Specialty Basket 69 oz. Keep it classy and sweet! Your loved one will enjoy some of the specialty items like divine butter toffee peanuts and tasty salt water taffy. A perfect gift for someone craving something sweet and something savory. Salt Water Taffy 32 oz. Mixed Nut Brittle 11 oz. Valentine Holland Mints 8 oz. Net Wt. 69 oz. Ship Wt. 7 lbs.